For conveyors not exposed to public view that are load, unload, transport or inclines/declines less than 7°, belting is composed of PVC 120 FS x FS, or as specified by customer. For conveyors exposed to level public view that are load, unload, transport or inclines/declines less than 7°, belting is composed of black PVC 120 COS x FS, or as specified by customer. 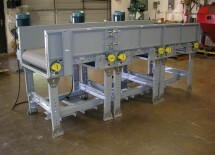 For incline/decline conveyors greater than 7°, belting is composed of a 2-Ply 150 lb. 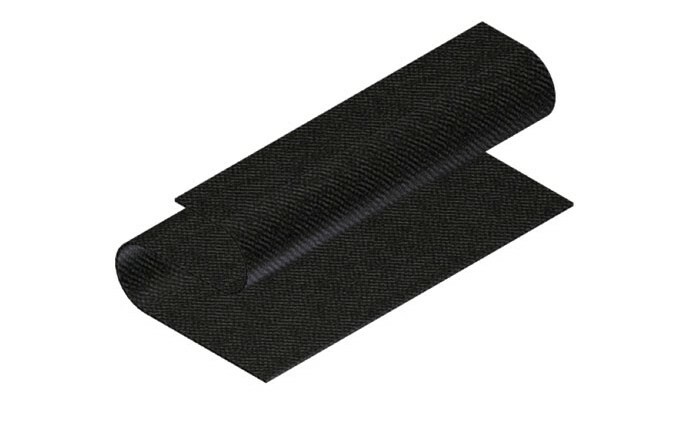 synthetic fabric black rough top belt, with 1/8” black SBR rough top x bare bottom surface (poly-nylon), or longitudinal grooved, or as specified by customer. Belting lacing is Clipper No. 2 with nylon coated wire cable. Longitudinal grooved belting uses Clipper UX-1 with nylon coated wire cable.